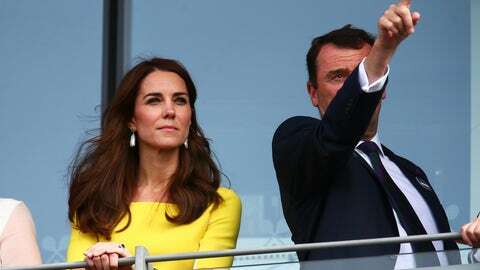 All eyes were set about eight feet above Centre Court on Thursday when Kate, the Duchess of Cambridge made her 2016 Wimbledon debut, sitting in the royal box resplendent in a tennis-ball-yellow dress. Oh man, Beyonce is going to be so jelly Serena is hanging with actual royalty and even more so because Kate's wearing the color of Lemonade. I smell diss track. But forget about Kate slumming it up by posing for an app made for commoners, the British tabloids were more in a frenzy that Kate had recycled her $1,000 Roksanda dress from a 2014 visit in Australia. Hey, the Brexit affected everybody, okay? Kate also met with the Williams matriarch, Oracene Price. Yet even with Snapchat, meetings with ballboys and various Williameses and playing hide-and-seek with Wimbledon chair Phil Brook, one question remained. 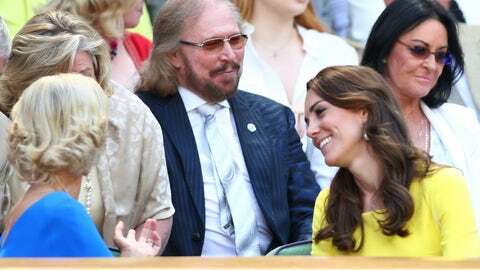 How does Barry Gibb not get a front row seat? Dude sang You Win Again!